Recently in Singapore, there's a new species of cows! Cows made of metals and they like to be bright, colourful and pretty. 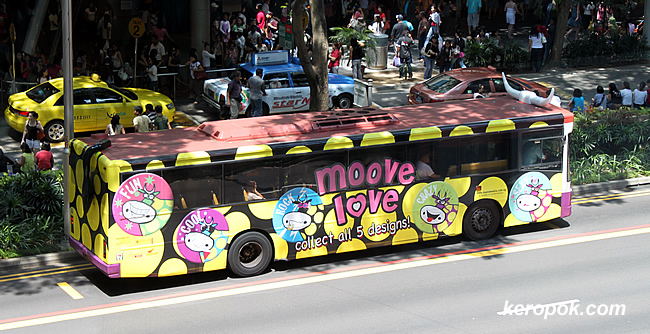 The honk of the bus does not produce a "mooo" sound though. Maybe the next generation of it. Labels: Seen on the streets. LOL! That is so cute! That is cool! Makes commuting more fun! The cow comes over every few months. They are so popular that the advertising company is selling the cow stickers! Wait till you board the Nokia bus! They transform it to look like a lounge inside! Really!